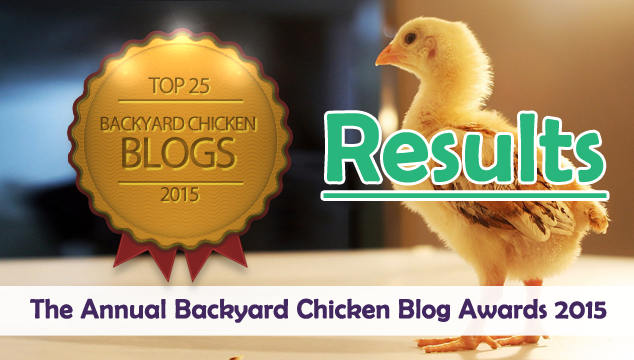 As many of you who read this blog will know, two weeks ago we started The Annual Backyard Chicken Blog Awards of 2015. You have been voting in your thousands and last Monday (6th July) the voting lines were closed. Before we get to the results I want to thank everybody who turned up and voted for their favourite backyard chicken blog. Now let’s take a look at the results and announce the winners. 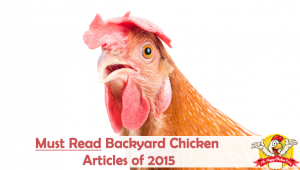 The most popular backyard chicken blog of 2015 is The Chicken Chick, the official blog of Kathy Shea Mormino. On the blog you will find Kathy shares her fun-loving, informative style to raising backyard chickens. In second place is Fresh Eggs Daily a hugely popular backyard chicken blog which is ran by Lisa Steele. Lisa is a fifth-generation chicken keeper, who got her first flock of chickens back in 2009. Not long after that, she started Fresh Eggs Daily and now has over 20,000 active subscribers. Started in 2010 by Melissa Caughey, Tilly’s Nest now has a huge fan base and a Facebook fan page with over 19,000 likes. On the blog you will find Melissa writes not only about chickens but also about gardening, beekeeping and natural homemade recipes. In fourth place is The Eggs and I. This is a relatively new blog (started in April 2014) but has really started to grow in size and popularity. Run by Chris Thompson, a registered nurse, you will find stories about raising a flock of 14 chickens in a subdivision. Backyard Poultry Magazine is the go to poultry magazine. They started back in 2006 and now have a blog to join the magazine. 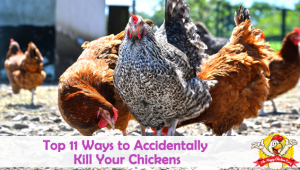 With numerous staff writers you will see a new blog post every day aimed at helping both new and established backyard chicken keepers. Chicken Blog is one of the oldest backyard chicken blogs on the internet and dates back to 2002. Natalie is the sole author of the blog and not only writes about keeping backyard chickens but often, more generally about her family. Chick in Boots is a newcomer to the backyard chicken blogging world. They have received a lot of fans so quickly due to their ‘unique’ blog writers. One of the main stars is Chick in Boot’s daughter who is 6 years old and provides weekly chicken tips! The City Girl Farming blog is run by Kerrie in addition to her other blogs- City Girl Chickens and City Girl Farming. 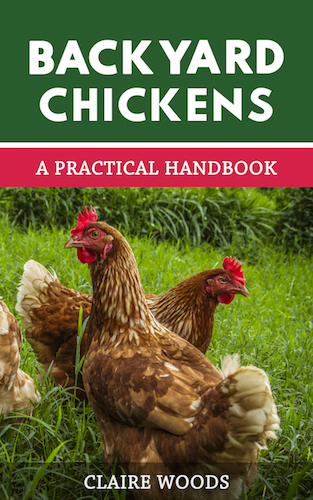 On the blog you will find very detailed chicken keeping guides which are normally accompanied with great pictures. Community Chickens is a spin off by Mother Earth News. The site is a ‘community blog’ where you can find bloggers from Mother Earth News and Grit magazines. This is a very active blog and you will see new blog posts several times per week. The Hen Cam blog was started in 2006 by Terry Golson. Terry has kept chickens for two decades so she has a lot of experience and knowledge to share with her readers. Also, there are four live-streaming webcams displayed on the site, so you can see Terry’s chickens live! Andy Schneider, also known as the Chicken Whisperer, has created a very popular podcast which is known as the Chicken Whisperer web radio show. In addition to the podcast Andy produces the Chicken Whisperer Magazine which is made monthly. Chickens in the Road is Suzanne McMinn’s blog and it has been providing backyard chicken keepers with advice since 2011. Suzanne not only keeps chickens- she also has cows, donkeys, horses and sheep. This blog is perfect for anyone looking to live a more self-sufficient lifestyle. Life At Cobble Hill Farm follows the life of Staci a ‘micro farm’ owner in upstate New York. The blog follows her frugal living and has some very interesting DIY projects and thrift ideas to help you create your own ‘homestead’ lifestyle for as cheap as possible. Most people will have heard of My Pet Chicken because of the vast online store which they run in the US. However they also run a very useful blog which has helped them gather over 100,000 Facebook fans. Most people will know McMurray Hatchery as the world largest rare poultry breeder. They put all of this knowledge to good use and have created the Backyard Chicken Blog. Each week they feature a new article which typically revolves around helping beginners raise their own chickens. Natural Chicken Keeping is run by a collection of long-time chicken keepers. The most popular figure on the blog is Leigh, who is a journalist by profession and chicken keeper by night! Anyone who is new to raising chickens will learn a lot from this blog as they have many articles on the site. Cold Antler Farm is Jenna Woginrich’s blog on all things homestead. Although she does mention her chickens a lot, the blog focuses on Jenna’s life as a homesteader, equestrian and hunter. This blog is perfect for anyone looking to get a behind the scenes view of what homesteading is like. Poultry Keeper is run by Tim Daniels and features over 700 articles on poultry keeping. The website provides a useful section on ‘New to Keeping Chickens’, which is ideal for beginners looking to start out. The Garden Roof Coop has been visited over 3 million times and continues to provide backyard chicken keepers with invaluable advice. You can also find the author of The Garden Roof Coop, Rebecca Nickols, over at Community Chickens which came ninth on this list. Pam Freeman is the creative mind behind Pam’s Backyard Chickens. Like The Garden Roof Coop, Pam normally blogs once a month, however the articles are normally well worth the wait. TBN Ranch documents the life of the small hobby farm owner Amy Elizabeth. Her farm is based in the idyllic foothills of the Sonoran Desert, which is where she raises her Bantam chickens. The Murano Chicken Farm is a family run hatchery. On the farm you will find Lisa Murano and anywhere between 80 and 100 chickens! This blog provides great, no-nonsense advice for those of you looking at how to care for your chickens cheaply. Laura Mikulski runs the Ferndale Chickens’ blog which is trying to educate urban people on the benefits of growing their own food. This blog is perfect for anyone looking to start growing their own food and living a more self-sufficient lifestyle. The Chicken Street is run by the duo Jill and Andy. They both have degrees in environmental sciences and love keeping backyard chickens. Like some of the other blogs mentioned here, they normally blog once a month but it’s definitely worth the wait. The final blog to make it into the Top 25 is Scoop From The Coop. The blog is run by Nutrena- the Horse and Animal Feeds supplier. They often produce wonderful infographics all about backyard chickens, which are well worth seeing. That concludes our top 25 list for this year’s Annual Backyard Chicken Blog Awards. Thanks to everyone who voted and until next year goodbye.